Sweet Tooth: SYDT in Mpls St. Paul Magazine! 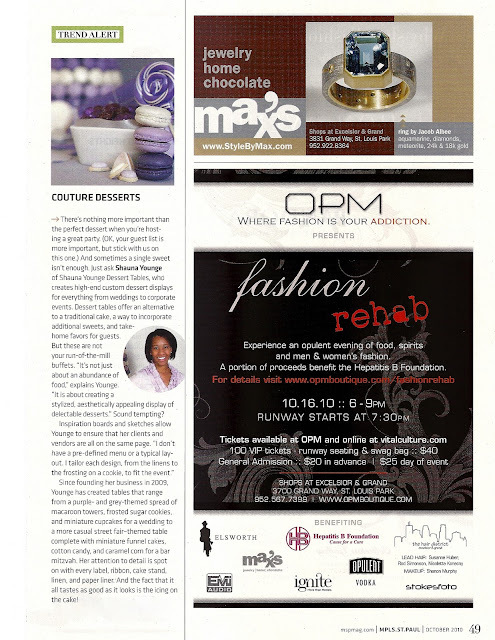 SYDT in Mpls St. Paul Magazine! Yesterday, I shared the cover of the current Mpls St. Paul Magazine with you. Today, I'm back with the feature. 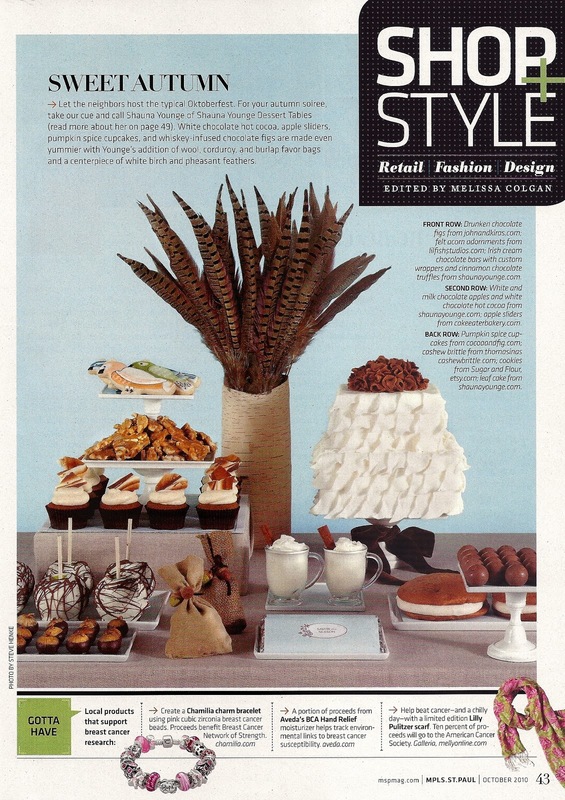 Editor Melissa Colgan's only requirement was that the table have a Fall theme. I chose to go with an unconventional color palette instead of the more expected red, orange, and yellow hues that are synonymous with Autumn. Thankfully, Melissa was on board with my concept. I hope you like it, too! To further turn convention on its head, I made an all-white abstract leaf cake with a flowery brown topper. 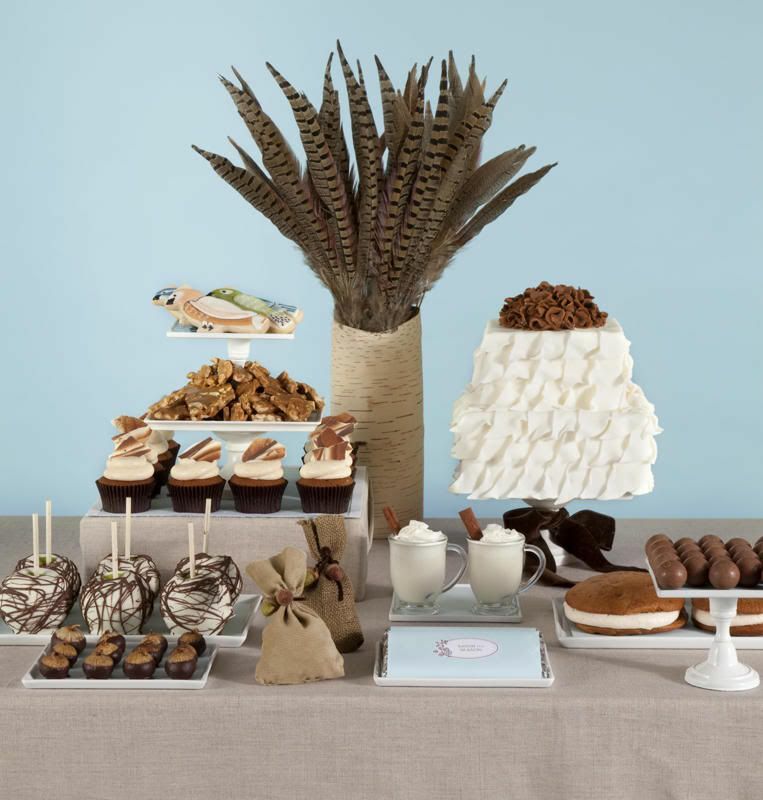 Custom bird cookies, these faux bois cupcake toppers, caramel chocolate apples, and pheasant feathers share the spotlight with whiskey-infused chocolate figs, white chocolate cocoa, and cinnamon truffles. I designed corduroy, burlap, and wool favor bags to bring some typical Fall fabrics to the design. I also chose chocolate brown velvet ribbon to add another cozy element. Along with this full-page spread, the magazine also featured another page with some info about me and the firm. I'm really thrilled to be featured in Mpls St. Paul Magazine, and I'd like to thank the awesome local bakers and artisans who helped bring my vision to life. Check out the article for more info about each vendor. So tell me, do you prefer unconventional color palettes or traditional ones when you decorate for the seasons/holidays? Just beautiful! Congratulations on the great feature!